Changing Seasons Style Autumn/Winter is the perfect time to add warmth and texture to the home, ensuring that it becomes a haven from the cold. Small changes in colour palette and textures can take the home seamlessly though into the winter months. Pastel Power – Often thought of as ‘summery’ hues, pastels are a surprising pick for Autumn/Winter, but when combined with warmer, luxurious and weighted fabrics such as velvet and wool they create an interiors seasonal hybrid to die for. Metallic Marvels – Metallics never go out of style, but opting for richer golds and coppers provide a great depth of colour. A table or floor lamp in a metallic finish is a fabulous mutli-tasking choice. It brings some much-needed light into the room as dark nights descend, whilst also adapting the colour scheme of the room, ready for winter. Snug as a Bug – Filling the home with inviting textures is key as the weather changes. Wooden or tiled floors are a very practical choice, but can seem much more appealing in the summer months. A little creativity with rugs and hides can take the chill out of any room. A snuggly sheepskin looks, and feels, lovely by the bed and takes away that freezing floor feeling! It’s also worth bearing in mind that rugs aren’t always best when grounded; they can be elegantly draped over the end of a sofa or chair, making any piece look winter-ready. Think Ahead – Once Autumn comes around, it’s only a matter of time until Christmas fever arrives. With a little careful planning, investing in a few new pieces now is great preparation for the arrival of guests over the festive period. Many of us spend more time in our living areas when the outdoors is far less inviting, so consider buying a pair of side tables which make a handy resting place for drinks or even as an extra seat for visitors. The Little Touches – In addition to a creating a visual feast on gloomy evenings, our other senses can benefit from a treat. An elegant room diffuser or scented candle in a deep, woody scent adds to the inviting atmosphere. Autumn/Winter is not a time for the minimal look, so don’t be afraid to adorn surfaces with decorative touches, even hanging on to pretty, empty diffuser bottles for an eclectic look. 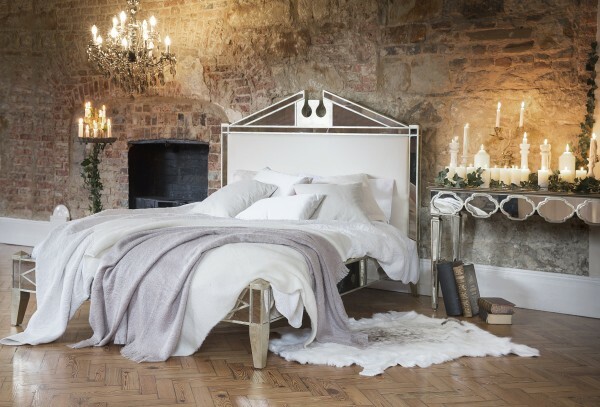 Swapping to winter bedding is something most of us make sure to do once the temperature drops, but using well placed accessories make the bed look even cosier. Pile up cushions or throws in colours that contrast the bed linen to create a look that pops and choose a fabric such as wool or velvet to exude fabulous warmth and texture.